The marginal contribution that nuclear deterrence now makes to the absence of major aggression between great powers is being purchased at too high a price. That price is the constant risk that a complex, tightly coupled and largely automated system subject to normal, systemic and human error will, as science tells us, inevitably fail, and fail catastrophically, with unprecedented and unjustified loss of civilian life…Nuclear weapons are useless for confronting and resolving the most likely future international security challenges, but steady progress towards the elimination of such weapons can help nations confront these transnational problems…[E]limination of nuclear weapons will allow creative, intellectual, technical and financial resources now devoted to nuclear threats to be focused toward the resolution of transnational crises faced by all nations. As nuclear weapons are drawn down those resources can be re-focused toward developing clean energy, carbon-capture technologies, clean water management and low-impact, high-productivity agriculture. The Federation of American Scientists (FAS) is calling on Energy Secretary Ernest Moniz to get involved in the case. According to Science journal, the lab recently made the following statement: “James Doyle’s separation from Los Alamos National Laboratory was a layoff due to the lack of available or anticipated funding in his area of expertise. The separation was unrelated to his publications or professional writings.” Many external arms control specialists are skeptical and believe Doyle’s downfall is the result of his airing of views that are unpopular among those opposing disarmament, including some of the Armed Services Committee’s Republican leaders and staff. 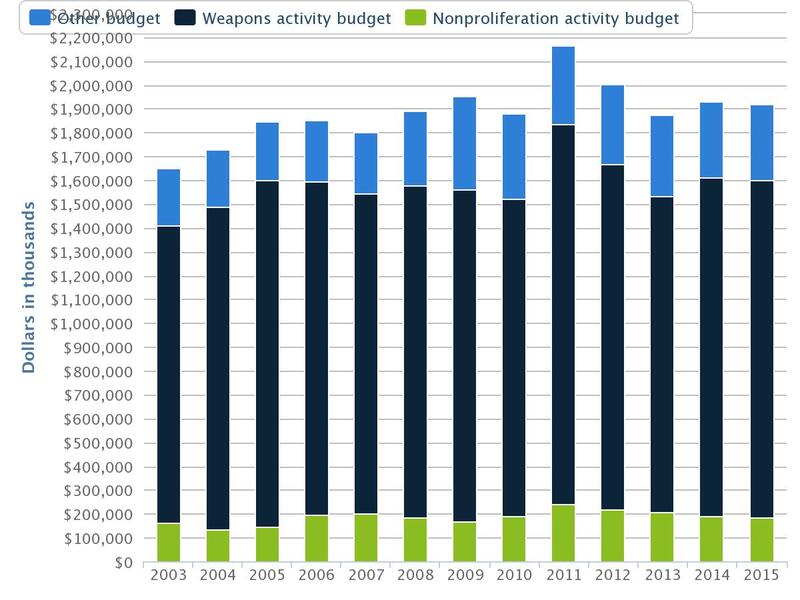 And if you’re curious about how many resources LANL spends on weapons activity versus nonproliferation, take a look at the following graph (reported by the Center for Public Integrity). According to Scientific American, the FAS begin with the “scientists’ movement” in the mid-1940s when many scientists who had worked on the Manhattan Project recognized that they had a special responsibility to educate policymakers and the public about the implications of nuclear energy and nuclear weapons. (Carl Sagan, who is one of my heroes, had served on FAS’s advisory council and was a leading scientist devoted to reversing the nuclear arms race.) The FAS’s Nuclear Weapons Database is one of the most reliable sources on global nuclear arsenals, and the numbers in the previous paragraph were obtained from it. As far as we know, the US is not developing new nuclear weapons, but unfortunately it’s improving the weapon delivery systems (see this report from the Union of Concerned Scientists). This does not aid the goals of nonproliferation and reducing nuclear weapons, nor does the US’s nearly 500 land-based missiles on “hair-trigger” alert. As I’ve mentioned in a previous post, nuclear weapons are also relevant to space security and to the risk of a space arms race. Although deploying nuclear weapons in space may be prohibitively expensive and are a violation of the Outer Space Treaty, certain nuclear missiles could have trajectories outside of the Earth’s atmosphere, and anti-satellite missiles are another concern. In any case, space weapons—nuclear or otherwise—increase tensions between countries and increase the risk of conflict. Another related issue is the Nuclear Nonproliferation Treaty (which, by the way, has never been signed by India, Israel, and Pakistan). In the 21st century era of worsening climate change, we need alternatives to fossil fuel-based energy, but nuclear energy surely is not ideal. It’s not clear how much, if it all, nuclear energy should play a role in our transition to a fossil fuel-free economy. Even in Iran, where there is an apparent abundance of oil, people are trying to prepare for the transition, and as in other places, they have turned to nuclear energy. An additional concern is that developing nuclear energy technologies produces a pathway for countries to develop nuclear weaponry as well; unfortunately, we’ve seen other countries follow this path already. In the case of Iran, as usual, what is required is a diplomatic and political settlement. As argued in a report by the FAS and the Carnegie Endowment for International Peace, by offering Iran cutting-edge alternative energy technologies, especially to take advantage of the country’s solar energy potential, a positive precedent could be set for other nuclear-hopefuls.